The primeval blessing, 'Be fruitful and multiply, and fill the earth,' first announced to humankind in Genesis 1.28 is renewed to Noah and his sons after the flood in Genesis 9.1. There is widespread scholarly consensus that the ensuing dispersion in Genesis 10.1-32 and 11.1-9 is the means by which the creation blessing is fulfilled. Kaminski argues that the primeval blessing is not fulfilled in the Table of Nations and that Yahweh's scattering Noah's descendants in the Babel story does not contribute positively to the creation theme. Rather, the creation blessing is being taken up in the primary line of Shem (Genesis 11.10-26), which leads directly to Abraham. ;She further suggests that divine grace is not absent after the Babel judgment, as is commonly assumed, but is at work in the Shemite genealogy. She argues that the primeval blessing, which is unfulfilled in the primeval history, is taken up by Abraham and his descendants by means of a divine promise. While the blessing is in the process of being realised in the patriarchal narratives, it is not fulfilled. The multiplication theme is resumed, however, in Exodus 1.7, which describes Israel's proliferation in Egypt. This is the first indication that the creation blessing is fulfilled. Realisation of the primeval blessing progresses after the flood, therefore, from Noah to Israel. Yet God's blessing on Israel is not for their sake alone - it is the means through which the divine intention for creation will be restored to the world. This is volume 413 in the Journal for the Study of the Old Testament Supplement series. - Publisher The author argues that the primeval blessing pronounced to Noah in Genesis 9:1 is not fulfilled in the ensuing Table of Nations (Genesis 10:1-32), as is commonly assumed by scholars, but is being realised through Israel in particular. 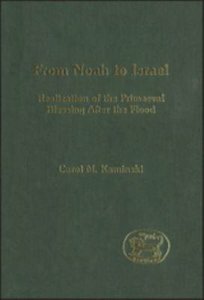 About "From Noah to Israel (Journal For The Study Of The Old Testament Supplement Series)"
The author argues that the primeval blessing pronounced to Noah in Genesis 9:1 is not fulfilled in the ensuing Table of Nations (Genesis 10:1-32), as is commonly assumed by scholars, but is being realised through Israel in particular. Carol M. Kaminski (Ph.D., Cambridge) is assistant professor of Old Testament at Gordon-Conwell Theological Seminary, Massachusetts, USA.